This name uses Spanish naming customs: the first or paternal family name is Caballé and the second or maternal family name is Folch. María de Montserrat Viviana Concepción Caballé i Folch OIC OAXS OMFRG LH OMIR (Catalan: [munsəˈrat kəβəˈʎe i ˈfoɫk]; 12 April 1933 – 6 October 2018) was a Spanish operatic soprano. She sang a wide variety of roles, but is best known as an exponent of the works of Verdi and of the bel canto repertoire, notably the works of Rossini, Bellini, and Donizetti. She was noticed internationally when she stepped in for a performance of Donizetti's Lucrezia Borgia at Carnegie Hall in 1965, and then appeared at leading opera houses. Her voice was described as pure but powerful, with superb control of vocal shadings and exquisite pianissimo. Caballé became popular to non-classical music audiences in 1987, when she recorded, at the request of the IOC, "Barcelona", a duet with Freddie Mercury, which became an official theme song for the 1992 Olympic Games. She received several international awards and also Grammy Awards for a number of her recordings. Caballé was born in Barcelona on 12 April 1933. Her family was of humble financial circumstances due to the Civil War. She studied music at the Liceu Conservatory, and singing technique with Napoleone Annovazzi, Eugenia Kemény and Conchita Badía. She graduated with a gold medal in 1954. She subsequently moved to Basel, Switzerland, where she made her professional debut in 1956 as Mimì in Puccini's La bohème. She became part of the Basel Opera company between 1957 and 1959, singing a repertoire that included Mozart (Erste Dame in Die Zauberflöte) and Strauss (Salome) in German, unusual for Spanish singers, but which proved useful for her next engagement at the Bremen Opera (1959–1962). In 1961, she starred as Iphigénie in Gluck's Iphigénie en Tauride at the National Theatre of S. Carlos in Lisbon, alongside Raymond Wolansky [de], Jean Cox, Paul Schöffler and others. In 1962, Caballé returned to Barcelona and debuted at the Liceu, singing the title role in Strauss's Arabella. From the fall of 1962 through the spring of 1963 she toured Mexico, at one point singing the title role in Massenet's Manon at the Palacio de Bellas Artes. This was followed by several more successful appearances at the Liceu in 1963. Caballé's international breakthrough came in 1965 when she replaced an indisposed Marilyn Horne in a semi-staged performance of Donizetti's Lucrezia Borgia at New York's Carnegie Hall, which earned her a 25-minute standing ovation. While this was her first engagement in a bel canto opera and she had to learn the role in less than one month, her performance made her famous throughout the opera world. Later that year, Caballé made her debut at the Glyndebourne Festival singing her first Marschallin in Richard Strauss' Der Rosenkavalier and portraying the role of Countess Almaviva in Mozart's Le nozze di Figaro. In December 1965, she returned to Carnegie Hall for her second bel canto opera, singing the role of Queen Elizabeth I in Donizetti's recently rediscovered Roberto Devereux. Caballé closed out the year with her Metropolitan Opera debut on 22 December 1965, appearing as Marguerite in Gounod's Faust alongside John Alexander in the title role, Justino Díaz as Méphistophélès, and Sherrill Milnes as Valentin in his debut at the Met. In 1966, Caballé made her first appearance with the Philadelphia Lyric Opera Company as Maddalena di Coigny in Giordano's Andrea Chénier and her Italian debut at the Maggio Musicale Fiorentino as Leonora in Verdi's Il trovatore, followed by Bellini's Il pirata in 1967. She returned to Philadelphia in 1967 to sing the title roles in Puccini's Tosca and Madama Butterfly, and to the Met to sing three Verdi heroines: Leonora alongside Richard Tucker as Manrico, Desdemona in Otello with James McCracken in the title role, and Violetta in La traviata, with Tucker and George Shirley alternating as Alfredo. The last role in particular garnered her further acclaim among American critics and audiences. She returned to the Met the following year in the title role in Verdi's Luisa Miller, and in 1969 for the role of Liù in Puccini's Turandot, with Birgit Nilsson in the title role and James King as Calàf. She also returned to Philadelphia as Imogene in Bellini's Il pirata (1968) and Lucrezia Borgia (1969). In 1969, Caballé appeared at the Arena di Verona in a Jean Vilar production of Verdi's Don Carlo. She was Elisabetta of Valois in an all-star cast including Plácido Domingo and Piero Cappuccilli. Her high B on the final "ciel" at the end of the opera lasted more than 20 bars up to the final chord from the orchestra. In these performances she had to act on crutches because of an accident earlier that year in New York City. In the same period she also appeared in recital at the Teatro Corallo in Verona. In 1970, Caballé made her official debut at La Scala in the title role of Lucrezia Borgia. She appeared as Leonora in Philadelphia, and returned to the Met as Amelia in a critically acclaimed production of Verdi's Un ballo in maschera with Domingo as Riccardo, and Reri Grist as Oscar. In 1972, she made her first appearances at Covent Garden and the Lyric Opera of Chicago, both in the role of Violetta. That same year she returned to the Met as Elisabetta in Don Carlo with Franco Corelli in the title role, and sang the title role of Bellini's Norma in Philadelphia. In 1973 she returned to Chicago to perform the title role in Donizetti's Maria Stuarda with Viorica Cortez, appeared as Violetta in Philadelphia. She performed at the Met as Bellini's Norma, opposite Carlo Cossutta in his Met debut as Pollione and Fiorenza Cossotto as Adalgisa. In 1974, Caballé appeared in the title role of Verdi's Aida at the Liceu in January, in Verdi's I vespri siciliani at the Met in March, and in Parisina d'Este at Carnegie Hall, also in March. She appeared as Norma at the Bolshoi Theatre in Moscow and in Adriana Lecouvreur at La Scala in April. She was filmed as Norma in Orange in July by Pierre Jourdain. She recorded Aida with Riccardo Muti in July and made a recording of duets with Giuseppe Di Stefano in August. In September 1974, she underwent major surgery to remove a large benign mass from her abdomen. She recovered and was performing again on stage by early 1975. In 1976 Caballé appeared at the Met once again as Norma and sang her first Aida in that house, alongside Robert Nagy as Radamès and Marilyn Horne as Amneris. She appeared in the title role of Ariadne auf Naxos by Richard Strauss and sang Mimì in Puccini's La bohème with Luciano Pavarotti as Rodolfo. 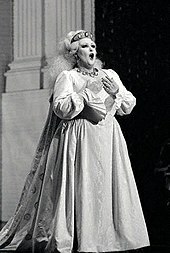 In 1977 Caballé made her debut with the San Francisco Opera in the title role of Puccini's Turandot. She returned to that house ten more times over the next decade in such roles as Elvira in Verdi's Ernani and the title roles in Ponchielli's La Gioconda, Rossini's Semiramide, and Puccini's Tosca, among others. Having lost some of her earlier brilliance and purity of voice, Caballé offered more dramatic expressive singing in roles that demanded it. In 1978, she was Tosca in San Francisco with Pavarotti, Norma in Madrid, and Adriana Lecouvreur at the Met opposite José Carreras. She continued to appear often at the Met during the 1980s, in roles such as Tosca (1980, 1985) and Elisabetta (1985), and also sang concerts in 1981 and 1983. Her final performance at the Met was on 10 October 1985 in Tosca with Pavarotti as Cavaradossi and Cornell MacNeil as Scarpia. Her voice was noted for its purity, precise control, and power. She was admired less for her dramatic instincts and acting skills than for her superb technique, vocal shadings, and exquisite pianissimos, which were inspired by Miguel Fleta. in Bellini's Norma, Caballé recorded both the title role (for RCA Red Seal in 1972, with Domingo as Pollione) and later the role of Adalgisa, to Joan Sutherland's Norma in a 1984 Decca recording conducted by Richard Bonynge. Although Bellini conceived the role of Adalgisa originally for a soprano, it is usually now sung by a mezzo-soprano. Caballé was one of few sopranos to have recorded the role, although she was over 50 years old at the time of the recording in 1984. In 1986 she also took a role in the biographic film Romanza final, directed by José María Forqué. In 1987, Caballé made a rare excursion into the world of pop music when she released a duet with Freddie Mercury, the lead singer of the rock band Queen, which was titled "Barcelona". The song was inspired by Caballé's home city and later used as one of the two official theme songs for the 1992 Olympic Games. Mercury was a great admirer of Caballé, considering her voice to be "the best in the world". The single was followed by an album of the same name which was released the following year and featured further collaborations between the two performers. The title track later became the anthem of the 1992 Summer Olympics which was hosted by Caballé's native city, and appeared again in the pop music charts throughout Europe. Caballé also performed the song live, accompanied by a recording by Mercury, who had died in 1991, before the 1999 UEFA Champions League football final in Barcelona's Camp Nou stadium. In 1994, writing for The Independent, Fiammetta Rocco said: "Caballe is one of the last of the true divas. Callas is dead, Kiri Te Kanawa is busy making commercials for Sainsbury's, and Mirella Freni has never really risen out of the narrow confines of being an opera lover's opera-singer. Caballe, on the other hand, has always had an enormous following, and it's still with her today." In 1995 she worked with Vangelis for his album El Greco, dedicated to the Greek painter. In 1997, Mike Moran produced the album Friends For Life, which includes duets with Caballé and such singers as Bruce Dickinson, Johnny Hallyday, Johnny Logan, Gino Vannelli, and Helmut Lotti. Caballé dedicated herself to various charities. She was a UNESCO Goodwill Ambassador and established a foundation for needy children in Barcelona. In 2003, she starred in her own documentary film Caballé: Beyond Music, which featured many well-known opera singers, including Domingo, Pavarotti, Carreras, and Renée Fleming. In 2002, she appeared as Catherine of Aragon in Henri VIII by Saint-Saëns, and in 2004 in the title role of Massenet's Cléopâtre, both at the Liceu. She appeared as The Duchess of Crakenthorp in Donizetti's La fille du régiment at the Vienna State Opera in April 2007.
no diva in memory has sung such an all-encompassing amount of the soprano repertory, progressing through virtually the entire range of Italian light lyric, lirico-spinto and dramatic roles, including all the pinnacles of the bel canto, Verdi and verismo repertories, whilst simultaneously being a remarkable interpreter of Salome, Sieglinde and Isolde. On 6 June 2013, Caballé was declared persona non grata in Azerbaijan after visiting, despite official warnings issued by the Azerbaijani embassy in Spain, the de facto independent state Nagorno-Karabakh and meeting with local leaders. In 2015 Caballé was under prosecution over allegations of tax evasion or fraud. She admitted that despite living in Spain in 2010, she had registered in Andorra in order to avoid paying tax in Spain. In December 2015 the Spanish court found her guilty of fraud and gave her a six-month suspended jail sentence, ordering her to pay a fine of €254,231 ($280,000). She was also banned from receiving any public subsidies for a period of 18 months. Caballé married Spanish tenor Bernabé Martí in 1964. They had two children; their daughter Montserrat Martí is also an operatic soprano. On 20 October 2012, during her tour in Russia, Caballé suffered a stroke in Yekaterinburg and was quickly transferred to the Hospital de Sant Pau in Barcelona. In September 2018, she was admitted to the same hospital for a gallbladder problem. She died there on 6 October 2018 at the age of 85. The cause of death was not given. Felipe VI of Spain described Caballé as "the best of the best", and Spanish prime minister Pedro Sánchez called her the great ambassador of Spain. Caballé recorded extensively throughout her long career and made many notable recordings of complete operas as well as recital albums. After a number of recordings early in her career for RCA Victor Red Seal, Caballé also recorded for EMI, Decca, and Philips among other labels. She left a "vast discography" of her major roles, including Aida, conducted by Riccardo Muti, Elisabetta in Don Carlo conducted by Carlo Maria Giulini, Fiordiligi in Mozart's Così fan tutte with Colin Davis, Liù in Turandot alongside Joan Sutherland and Pavarotti, conducted by Zubin Mehta, and Salome with Erich Leinsdorf. She recorded many bel canto and Rossini roles. Recital recordings include a Puccini collection with Charles Mackerras, a Strauss collection with Leonard Bernstein, and duets with Shirley Verrett. She performed the soprano solo in Verdi's Requiem with John Barbirolli. A conservatorio in Arganda del Rey is named after her. Of Caballé's recordings, several won a Grammy Award: Rossini Rarities in 1966, Puccini's La bohème in 1968, and Mozart's Così fan tutte in 1974; other recordings were nominated for the award. 1991: Prince of Asturias for the Arts. ^ a b Smith, Bonnie G. The Oxford Encyclopedia of Women in World History. Oxford University Press. ^ "The Grove Book of Operas". Archived from the original on 6 October 2018. Retrieved 6 October 2018 – via Google Books. ^ a b c d Biography of Montserrat Caballé at operissimo.com (in German) Archived 27 March 2012 at the Wayback Machine. Hosting.operissimo.com. Retrieved 29 October 2015. ^ a b c d e f g h "Metropolitan Opera Association". Archives.metoperafamily.org. Archived from the original on 26 June 2012. Retrieved 6 October 2018. ^ "Montserrat Caballé: A Voice of Passionate Grandeur". Archived from the original on 6 October 2018. Retrieved 6 October 2018. ^ "Perfectly Lovely – Montserrat Caballe". 13 October 2012. Archived from the original on 6 October 2018. Retrieved 6 October 2018. ^ "The Cuperto". voiceteacher.com. Archived from the original on 6 February 2018. Retrieved 6 October 2018. ^ Katz, Joel (4 August 2011). "Voice and opera training: Those Caballe pianissimi". Archived from the original on 6 October 2018. Retrieved 6 October 2018. ^ Riggs, Geoffrey S. (2003). The Assoluta Voice in Opera, 1797–1847. Jefferson, North Carolina: McFarland. pp. 125, 127, 144. ISBN 0786440775. Archived from the original on 6 October 2018. Retrieved 6 October 2018. ^ McCants, Clyde T. (28 February 2003). "Opera for Libraries: A Guide to Core Works, Audio and Video Recordings, Books and Serials". McFarland. Archived from the original on 6 October 2018. Retrieved 6 October 2018 – via Google Books. ^ a b c "Montserrat Caballé, Barcelona opera singer, dies at 85". BBC. Archived from the original on 6 October 2018. Retrieved 6 October 2018. ^ Sullivan, Caroline (27 September 2012). "Freddie Mercury: the great enigma". The Guardian. London. Archived from the original on 9 June 2015. Retrieved 9 April 2015. ^ Mitten, Andy, ed. (1999). "The Long Road Trip to Victory". Kings of Europe. Manchester United: 11. ^ Pilger, Sam (June 1999). Barnes, Justyn (ed.). "The Promised Land". Manchester United. Manchester United. 7 (8): 27. ^ "When the ample Catalan sings: Callas is no more; Kiri Te Kanawa is". Archived from the original on 6 October 2018. Retrieved 6 October 2018. ^ "Montserrat Caballé: Friends for Life – Montserrat Caballé – Credits". AllMusic. Archived from the original on 6 October 2018. Retrieved 6 October 2018. ^ "Caballe: Beyond Music". operatoday:com. Archived from the original on 6 October 2018. Retrieved 6 October 2018. ^ "Vorstellungen mit Montserrat Caballé". Vienna State Opera. Archived from the original on 6 October 2018. Retrieved 6 October 2018. ^ a b c "The soprano Montserrat Caballé has died". Gramophone. 6 October 2018. Archived from the original on 6 October 2018. Retrieved 6 October 2018. ^ Montserrat Caballe Declared Persona Non Grata In Azerbaijan Archived 7 January 2016 at the Wayback Machine. Radio Free Europe/Radio Liberty/Radio Liberty. 6 June 2013. Retrieved 27 April 2015. ^ "Montserrat Caballé, Spanish Soprano, Fails to Appear in Court to Settle Tax Case". Archived from the original on 6 October 2018. Retrieved 6 October 2018. ^ Soprano Montserrat Caballé given six month sentence for tax evasion Archived 16 December 2015 at the Wayback Machine. The Local. 15 December 2015. ^ Olabarrieta, Ane (6 October 2018). "La gran historia de amor de Montserrat Caballé y su marido Bernabé Martí". El Español (in Spanish). Archived from the original on 6 October 2018. Retrieved 6 October 2018. ^ EFE (3 October 1992). "Una nota de mujer". El Tiempo (in Spanish). Archived from the original on 6 October 2018. Retrieved 6 October 2018. ^ Meléndez-Haddad, Pablo (23 October 2012). "Montserrat Caballé, en observación tras sufrir un ictus reversible". ABC (in Spanish). Archived from the original on 15 July 2014. Retrieved 3 August 2014. ^ "La soprano Montserrat Caballé, hospitalizada en Barcelona". El País (in Spanish). Barcelona: Prisa. 24 September 2018. Archived from the original on 6 October 2018. Retrieved 6 October 2018. ^ Cia, Blanca (6 October 2018). "Muere Montserrat Caballé, la diva de todos". El País (in Spanish). Prisa. Archived from the original on 6 October 2018. Retrieved 6 October 2018. ^ a b "Spanish opera singer Montserrat Caballe dies at 85". ^ "Audio recordings with Montserrat Caballé". Library of Congress. Archived from the original on 6 October 2018. Retrieved 6 October 2018. ^ Steane, John (25 April 2014). "Puccini's Turandot: a survey of recordings". Gramophone. Retrieved 13 October 2018. ^ "Montserrat Caballe". 22 May 2018. Retrieved 6 October 2018. ^ "Premio Principe de Asturias de las Artes 1991" (in Spanish). Fundacion Princesa de Asturias. Retrieved 31 January 2017. ^ "Decreto 1710/1975 por el que se concede la Gran Cruz de Orden Civil de Alfonso X El Sabio a doña Montserrat Caballé" (PDF). Boletín Oficial del Estado (in Spanish). Ministerio de Educación y Ciencia. 18 July 1975. p. 15514. Archived (PDF) from the original on 10 August 2014. Retrieved 3 August 2014. ^ "RSH - Wie alles begann... - RSH Gold 1996". Rsh-history.de. Archived from the original on 7 October 2018. Retrieved 6 October 2018. ^ "Opernstar Montserrat Caballé bekommt Bundesverdienstkreuz". ShortNews. 10 October 2003. Archived from the original on 1 October 2011. Retrieved 19 March 2011. ^ "Montserrat Caballé – Biography". Artists Stefan Schmerbeck Management website. Archived from the original on 21 March 2012. Retrieved 19 March 2011. ^ "Caballé recibe la Legión de Honor de Francia" (in Spanish). Archived from the original on 6 October 2018. Retrieved 6 October 2018. ^ Interview Archived 4 March 2016 at the Wayback Machine im Online Merker, April 2007; retrieved 20 October 2015. ^ "Universitat Honoris Caballe" (PDF). Ub.edu (in Spanish). Archived (PDF) from the original on 24 April 2018. Retrieved 6 October 2018. ^ "Le onorificenze della Repubblica Italiana" [The honors of the Italian Republic]. Quirinale.it (in Italian). Archived from the original on 6 October 2018. Retrieved 6 October 2018. ^ "Montserrat Caballé, investida doctora 'honoris causa'" (in Catalan). 8 February 2011. Retrieved 9 February 2011. This page is based on the Wikipedia article Montserrat Caballé; it is used under the Creative Commons Attribution-ShareAlike 3.0 Unported License (CC-BY-SA). You may redistribute it, verbatim or modified, providing that you comply with the terms of the CC-BY-SA.